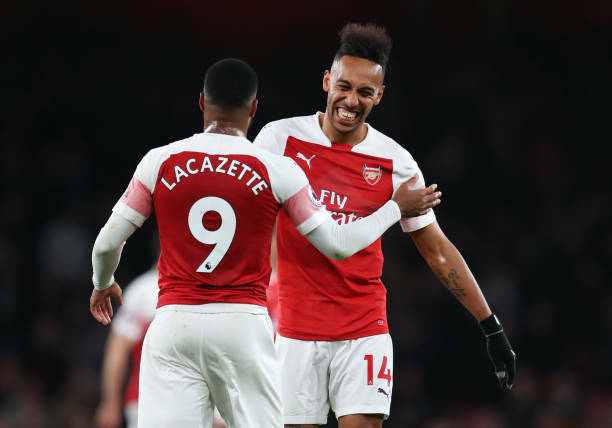 Arsenal’s head coach Unai Emery has hint at starting both Lacazette and Aubameyang in the Europa League match against Napoli and we look at the formations that he could use. Arsenal will tomorrow play the first leg of their UEFA Europa League tie against Napoli who are second on the Italian Serie A table. According to what Unai Emery said in the press conference about Aubameyang, the Gabon star and Lacazette could be in the starting eleven that faces Napoli so let’s take a look at the possible formations that Emery might go with to start them together. This is a formation which Unai Emery decided to use in Arsenal’s matches against Manchester United and the Rennes match at home. This formation worked perfectly as he would have hoped because the presence of Aaron Ramsey and Mesut Ozil in the starting eleven was enough to make sure that they get the ball to Aubameyang and Lacazette despite having no wingers in the squad. This squad sees Aubameyang and Lacazette play side by side and wingbacks can stomp forward from time to time to send crosses to the two strikers while two central midfielders make sure that the gunners have stability in the midfield. Aaron Ramsey played only 45 minutes in the 1-0 loss to Everton but he could be ready to start tomorrow and Granit Xhaka is back in full training, so there’s a possibility that Emery will use this formation against Napoli so that he utilities the services of both Aubameyang and Lacazette. Arsenal has used a back three in its last four matches against Manchester United, Rennes (H), Newcastle United and the recent one against Everton. The three-man defence was exposed on Sunday because the opponents had pacy attackers because the wingbacks sometimes went way forward, so this could see Unai Emery go back to four at the back system to prevent Napoli from using the same tactic. So how do Aubameyang and Lacazette fit in this formation? Well they can be among the front three and Emery would have to add Alex Iwobi to the mix to create an attacking trio of; Iwobi, Lacazette, Aubameyang.